Over 150 years ago, a budding English economist named William Stanley Jevons warned that a policy of energy efficiency might not be sufficient to conserve Britain’s dwindling coal reserves. His argument, now known as the Jevons paradox, was simple: Squeeze more energy from less coal, and people will just want more coal. The energy landscape has changed dramatically since the Victorian age, but the Jevons paradox still holds true. The theory may present a challenge to societies grappling with finite resources, but it’s great news for renewable power sources such as wind. By Jevons’ logic, boosting the efficiency of wind turbines should increase demand for the cheap, low-carbon electricity that they generate. Energy efficiency is the name of the game for New York-headquartered TerraForm Power, which owns one of the largest wind turbine fleets in North America. TerraForm, which has 1.6 gigawatts of installed wind power in the United States and Canada — enough to power all of Bhutan or Angola — has chosen GE Renewable Energy to manage its massive fleet. GE gets results for TerraForm because it has a unique strength: It marries human know-how with the latest digital technology. Anand, who has worked for GE for 20 years, says that experienced technicians are constantly fine-tuning turbine machinery. 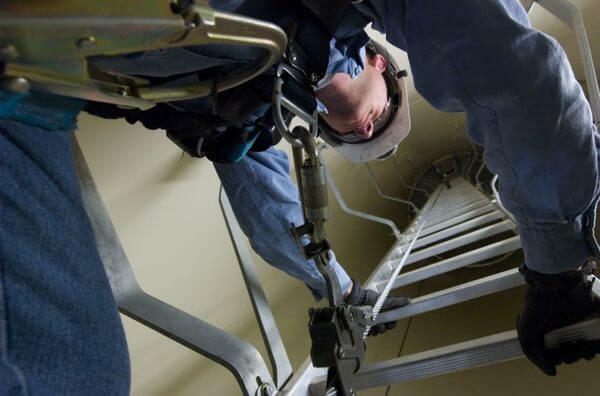 The technicians are just like skilled garage mechanics with a head for heights. 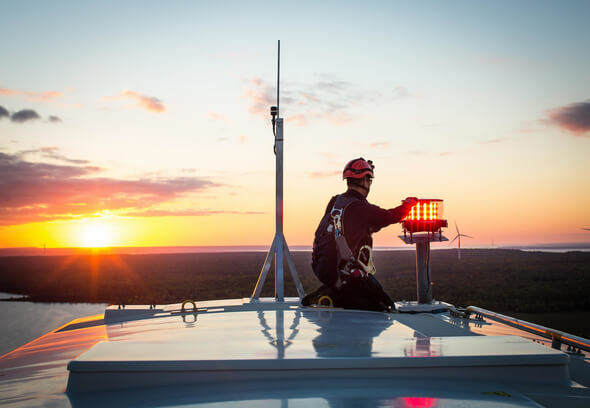 For instance, they will regularly scale turbine towers to inspect, monitor and repair equipment in the nacelle, the box at the top of the tower that houses the gearbox, generator and controller. They will ensure the power-production kit keeps purring like a well-tuned car engine. A technician scales a ladder to peek inside a turbine’s nacelle at the Panther Creek Wind Farm in Big Spring, Texas. Engineering know-how combined with modern software capability can lead to big wins in wind-power efficiency. Above and top images credit: GE Renewable Energy. On the digital side, powerful software harvests mountains of data drawn from every component of a wind turbine. The cloud-based software then runs the numbers to make intelligent decisions that will minimize costly downtime while maximizing lucrative power generation. For example, sensors could allow the software to pick up on subtle changes in the oil that lubricates a turbine’s gearbox. The gearbox houses the crucial cogs that produce a change in torque, or rotational force, between the slow-moving rotor blades and the high-speed power generator, increasing rotations from about 30 to 60 per minute to 1,000 to 1,800 per minute — which is enough to produce electricity. Like Goldilocks’ porridge, the oil lubricating the gearbox needs to be just right — at precise levels of stability, viscosity, and tolerance to water, temperature fluctuations and corrosion. If the oil loses some viscosity because of higher temperatures, it’ll offer less resistance to the moving parts in the gearbox. But GE’s software will quickly pick up from historical data patterns that the oil is thinning, and alert engineers to the fact well before it needs changing. “The ton of data that we have collected from wind farms over the years means that we are getting better at not just detecting these kinds of problems, but also predicting what could go wrong,” says Anand. This early heads-up from the software is invaluable, but in the end it’s people in the field who make the fixes that keep the turbines spinning. GE can notify on-site personnel as well as dispatch a crew of engineers to get ahead of the problem and prepare to change the gearbox oil quickly and efficiently. The risk of gearbox failure — meaning turbine downtime — is minimized, and those hours of expensive downtime become power-generation hours. Now imagine squeezing the same efficiencies from over 900 turbines, and you can see how the combination of modern software and human expertise wins tens of megawatt hours. But the software doesn’t just eliminate underperformance — it could also maximize output. For example, by analyzing data about the pitching of a turbine’s blades during windy weather, it could tweak the angle of the blades to capture optimum airflow, says Anand.